My kitchen table is a mess. but it still looks downright filthy. The mess makes me happy. Truly, it makes my heart sing with joy. purple paint, red paint, smudges of yellow paint. As of tonight, it has also been decorated with fabric paint. Why? Well, I thought we were using glitter glue. Nope, it was fabric glitter paint. I would have been happy with the mess that made, too. many-a-child's painting themselves every color under the sun. It has been colored on, painted on, glued, and scratched. There are knicks, stains, scrapes, and even teeth marks on the corners. but I have made beautiful memories with my children and hope they will one day say the same. 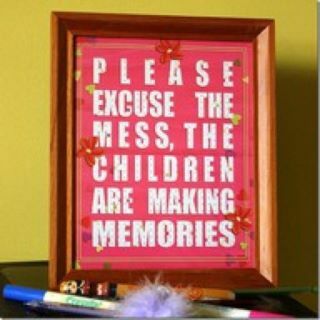 Sounds like our table :D I know you are making great memories!